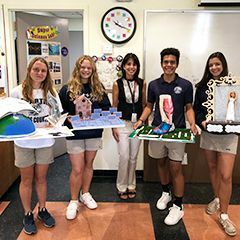 In this Pulse blog post, we take a look behind the scenes of the first couple of weeks in Ms. Aronson's 10th grade chemistry class. Students were asked to think about their passions and relate them to chemistry. 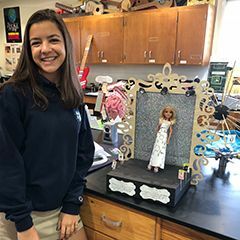 Following some initial research, students produce a 3-D model that creatively expresses the association they have discovered. Students often think that chemistry is only about balancing chemical equations or that they take the class because of the science sequence. My years of teaching chemistry only supports my belief that unless students construct their knowledge of chemistry they will never view the topic any differently. To guide the students from day one in the chemistry lab, I present a project tasking students to reflect on their passions, or possible future career paths, and determine the relationship to chemistry. A gallery walk through the class projects reveals the variety of pursuits and pastimes and, additionally, provides a means to learn about each student. Some of their projects are shared below. 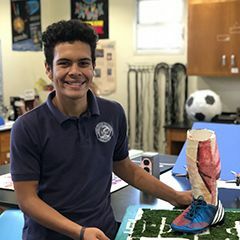 William P. '21 took his passion for sports, specifically soccer, and correlated it to the physiological effects of dehydration. Gabriella A. '21 is a talented musician and singer. She took her project to the stage, showcasing how the adrenal glands release adrenaline when you are nervous. This happens frequently when you are performing in front of an audience. Zoey A. 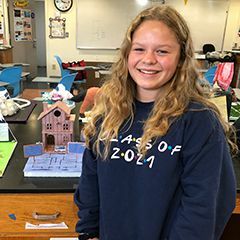 '21 wants to be an architect. She shared information about the ingredients that go into building materials such as windows and walls. 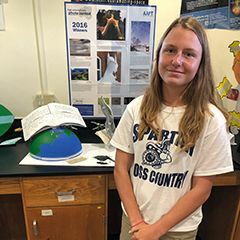 Mary H. '21 dreams of being a travel writer. She wondered, how is paper made? To start, raw wood must first be turned into "pulp. This watery soup of cellulose wood fibers, lignin, water, and chemicals used during the pulping process gives paper its form. Regardless of our personal interests, chemistry is seamlessly threaded through our lives whether we recognize it or not. What’s your passion and how does it relate to chemistry?